Kenneth Wade Hill (born December 14, 1965 in Lynn, Massachusetts) is a former starting pitcher in Major League Baseball who pitched for 14 years with seven teams. He pitched in the 1995 World Series as a member of the Cleveland Indians. He also appeared in the 1994 All-Star Game in Pittsburgh's Three Rivers Stadium. Hill was called up by the injury-plagued St. Louis Cardinals in 1989, had a good first start, and went downhill from that point. He finished that season with a 7-15 record and a decent 3.80 ERA. He wouldn't see a decent season until 1991, going 11-10 with a 3.57 ERA. In November 1991, he was traded to the Montreal Expos for first-baseman Andres Galarraga. It was as a member of these Expos that Hill found his groove. In both 1992 and 1994, Hill won 16 games, going 16-9 with a 2.68 ERA in 1991 and 16-5 with a 3.32 ERA in 1994. He was also an All-Star in 1994, pitching 2 innings in relief and walking one batter, and finished 2nd in Cy Young voting to Greg Maddux. Hill was brought back to the Cardinals, where he suffered the same fate he endured in his first tour of duty with the Cardinals, only winning 6 games, losing 9, and posting a 5.06 ERA. 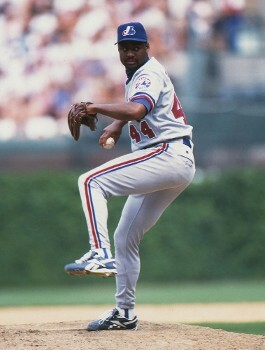 Hill was traded to the Cleveland Indians for David Bell, Rick Heiserman, and Pepe McNeal. He did well for the Indians, going 4-1 in the remainder of the regular season and 2-1 in the postseason. He filed for free agency in the 1995 postseason, being signed by the Texas Rangers, tied for the team lead (along with Bobby Witt) with 16 wins and led the Rangers to the postseason. It was in 1997 that Hill suffered an injury, sending him to the DL and effectively ending his playing career. 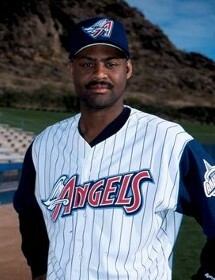 He also played for the Anaheim Angels, traded in 1997 for Jim Leyritz. He performed poorly over the next 2 years, going 13-17 and finally being relegated to the bullpen in 1999. He was released in August 2000, signed by the Chicago White Sox, for whom he promptly gave up eight runs in three innings, and was then released two weeks later. He accepted a non-roster invite by the Tampa Bay Devil Rays in 2001, and appeared in 5 games for them before being released.